Reviews of my book Big Farms Make Big Flu are beginning to roll in. The popular narrative of deadly viruses emerging from wild animal reservoirs clearly appeals to humankind’s deeply rooted fascination with wildlife and its dangers. But isn’t such a focus on the zoonotic origin of emerging infectious diseases distracting attention from the more important social, economic, and cultural forces operating at diﬀerent spatial and temporal scales and contributing to the chain of causality leading to epidemics? What makes Wallace’s book a must-read for those concerned with emerging infectious diseases, and many other issues emerging from modern food systems, is the breadth of interrelated themes and the richness and thought-provoking nature of the assemblage. Readers will put down this book thinking of emerging infectious diseases in a diﬀerent light; cognisant of their multiple and intertwined root causes in the context of our rapidly changing agro-ecological environment. Highly Pathogenic Avian Influenza, again. In the autumn of 2016, several cases of avian influenza H5N8 were detected across Europe (OIE-FAO 2016). Some cases were dead wild birds, others were domestic birds. Several farms had to execute culls in the ten thousands, for instance in Cloppenburg, Germany, were 16,000 birds were killed in November 2016. A few days earlier, the US president Barack Obama visited Germany for the last time during his presidency. During his visit, in a joint paper with German chancellor Angela Merkel, he analysed the importance of transatlantic relations. One line stood out and was repeated throughout media headlines: “we will never return to a pre-globalization economy” (quoted in Wirtschafts-Woche 2016). So what has that to do with dead birds? 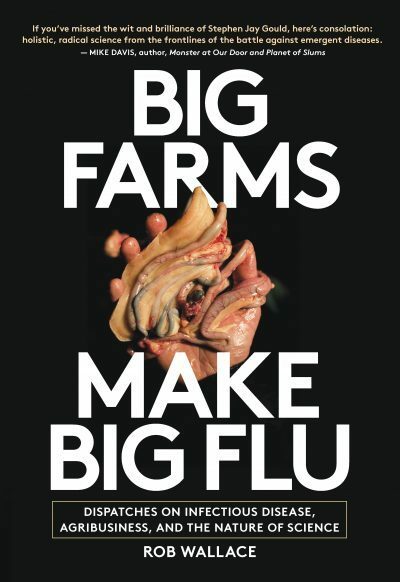 Everything–if you dare to read Rob Wallace’s new book on infectious disease and agribusiness, Big Farms Make Big Flu…The emergence and evolution of influenza is clearly intertwined with neoliberal economic practices that put surplus value over use value. After reading Wallace’s book, one cannot be surprised any longer… Big Farms Make Big Flu is one crucial step forward in disclosing what is happening in the factories that used to be our barns and deserves a wide readership from all backgrounds. 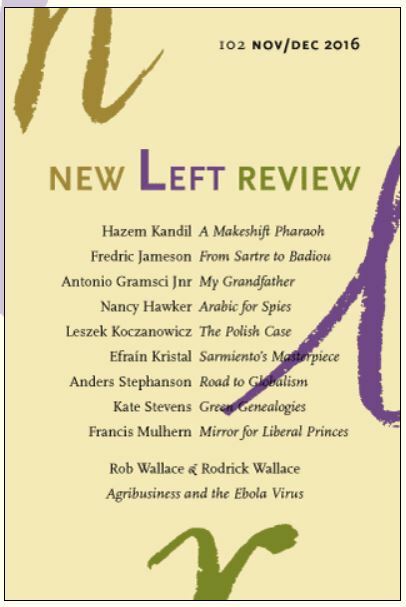 In the meantime, New Left Review published an edited excerpt of many of the key points of our Neoliberal Ebola book. Policies aimed at re-engineering local economics for the benefit of multinationals have had a drastic impact on landscapes and ecosystems, and thus upon the fortunes of infectious disease. As epidemiological history attests, context is more than just a stage upon which pathogens and immunity clash. The regional agro-economic impacts of global neoliberalism can be felt across the levels of biocultural organization, down as far as the virion and molecule…A growing public- and animal-health literature suggests that current patterns of agro-economic exploitation raise the risk of a new pandemic… Ecosystems in which ‘wild’ viruses are controlled by the rough-and-tumble of environmental stochasticity are being drastically streamlined by deforestation and plantation monoculture. Pathogen spillovers that once died out relatively quickly are now discovering chains of vulnerability, creating outbreaks of greater extent, duration and momentum. “The political economy of Darwin’s era, which produced Manchester liberalism and Free Trade was based on the following belief: If every man is left to himself to produce and exchange freely the commodities of society, the result will be for the maximum benefit of all, including himself. His private profit will be society’s good. All exchange-value will then represent value to society, and just as much, and no more, will be produced than society needs, while every man will get a fair return for his labours…. Caudwell’s thinking eighty years ago has much to offer twenty-first century biology. So a nice way to end a busy year of publishing and touring. To you and yours a wonderful new year! 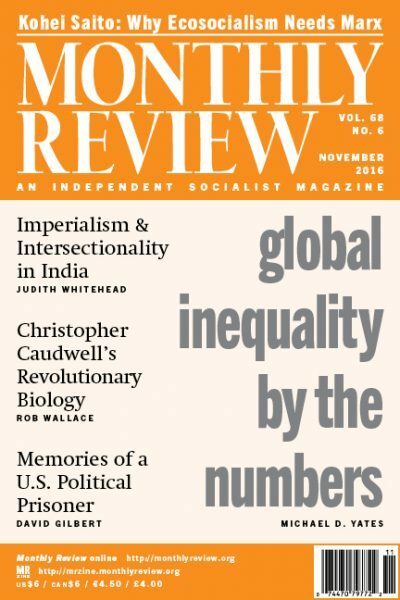 This entry was posted on December 21, 2016 at 8:58 pm and is filed under Ecological resilience, Evolution, Influenza with tags Antipode, Big Farms Make Big Flu, book review, Jonathan Everts, Lancet Infectious Diseases, Marius Gilbert, Neoliberal Ebola, New Left Review. You can follow any responses to this entry through the RSS 2.0 feed. You can leave a response, or trackback from your own site.